I have the most muscly legs I’ve had since I played hockey at school, legs are today bare and I’m not cringing about it. My belly is still the same (is there such a thing as “cyclist’s belly”?). I have issues with bike locks. I have bought 4 in 3 months at £30 each, thus negating entirely the savings made from the tube. This is due to keys breaking from jiggling around in my basket or from keys being lost from falling out my basket. But I’m not stupid! After only 4 times, I now do not keep my lock and key in my basket. 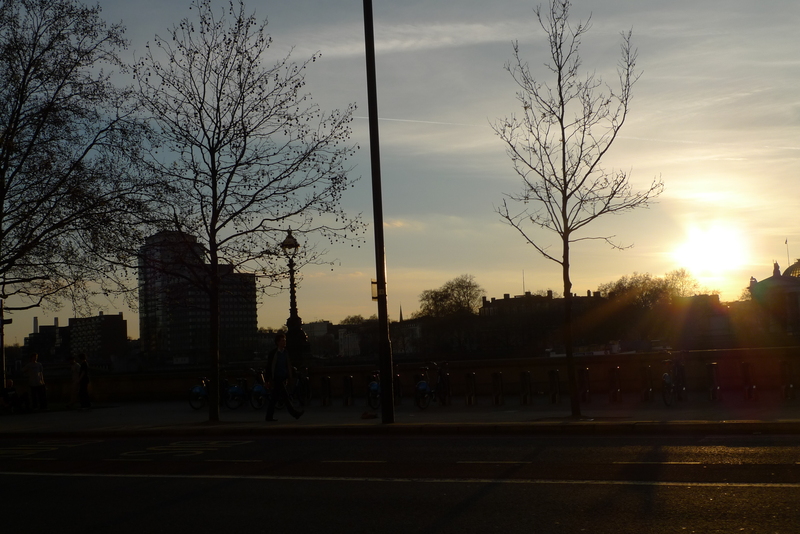 Cycling to areas I’ve never been in London is brilliant – I went from Soho to Southwark to Tower Bridge to Brixton the other day after work and saw a whole heap of buildings I’d never seen AND the sunset over the Thames. 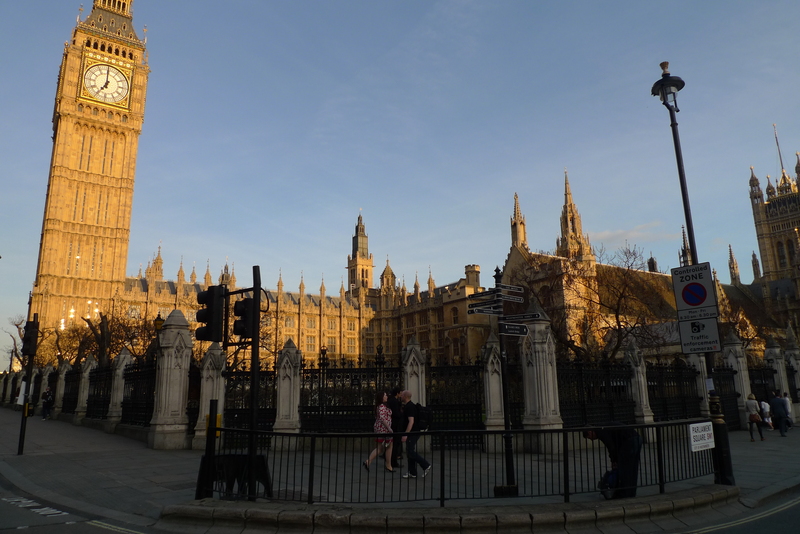 But I’m always lost – Notting Hill to Brixton took me via Buckingham Palace. But this is great, I’m getting to know London and how she interconnects. Finding yourself on a 4-lane motorway type thing with lorries zooming past you and not knowing which lane to be in will ALWAYS be scary. I find it best to shriek a little bit, wobble, and then keep going straight. I got the tube for the first time today in months and I must admit I was excited because I GOT TO READ THE METRO again but that was by far the best thing about the journey (a story about a pigeon with some bread on its head – hurrah!) which was otherwise hot, slow and squashed. 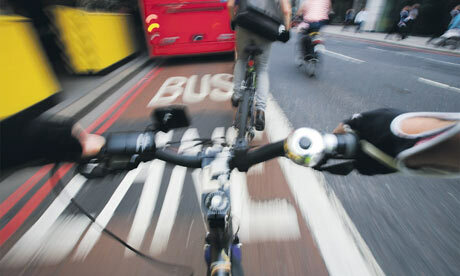 I have had 3 mini cycle accidents and all 3 have been caused by me, you do actually need to concentrate a bit. 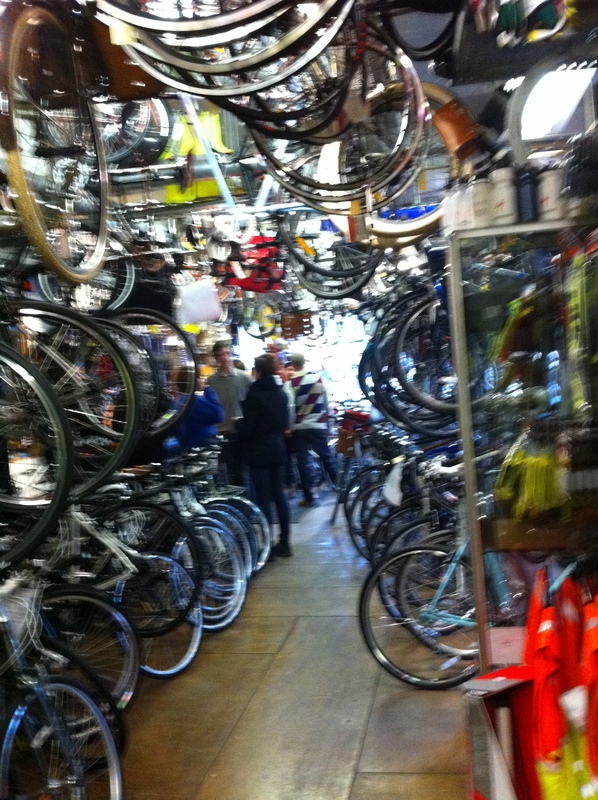 There should be more bike racks in London, particularly outside shoe shops and restaurants. Hear that Boris? List of most annoying fellow road users: 1. White van men who don’t see you 2. Moped riders who cut you up 3. 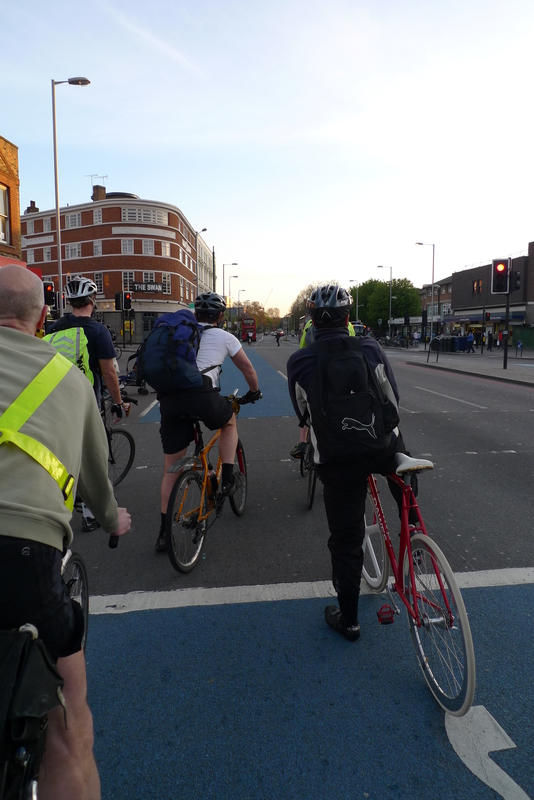 Cyclists who go through red lights (unless late for work in which case it is entirely acceptable*) 4. White van men who make comments about the length of your skirt 5. Bus drivers who don’t leave you enough space to get round. 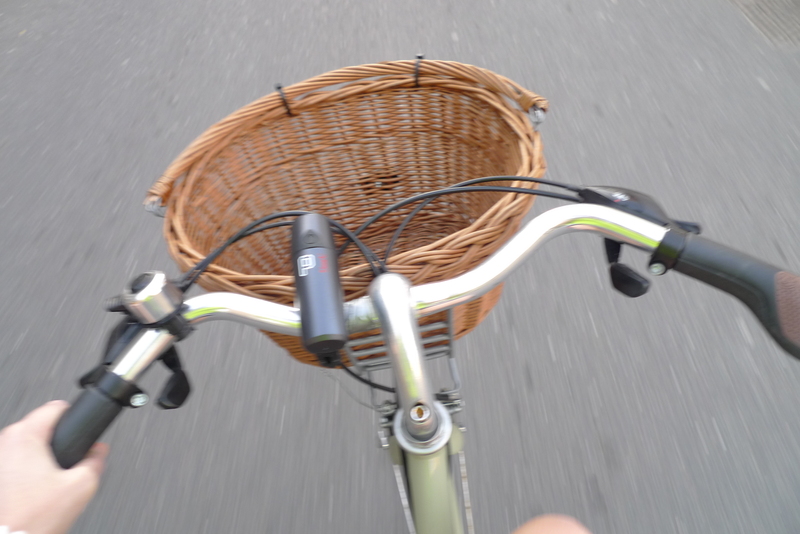 So for anyone intrigued enough to start cycling, here’s a photographic guide to my journey (and note: taking photos while cycling is also not a good idea, I almost cycled into a taxi). UPDATE: Cathy’s comment below reminds me, I now cycle in my normal work clothes, but pencil skirts don’t work as they slowly work up your thighs until you are effectively flashing everyone. And you don’t want to wear anything you would be upset about sweating over or getting a little oily. So I’m now wearing work clothes that are a little more casual – A-line skirts and dresses, loose and light, and I ALWAYS cycle in heels, much more fun to cycle glam – but don’t get me wrong, I still cycle fast and I WILL overtake you if you don’t get a move on. Hurrah! 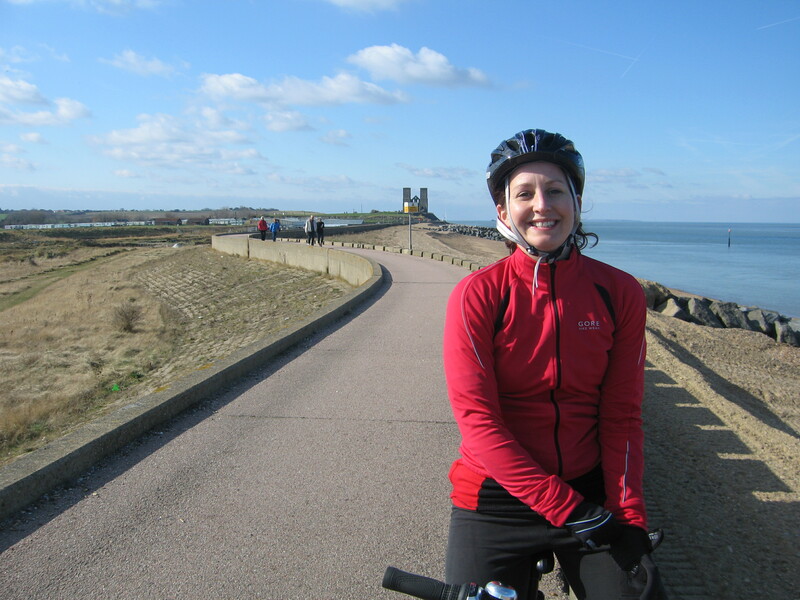 Guest Post – Get on your bike! Note from Sasha: I met Pippa in Prague in 2006. She moved to London in 2007 and really inspired me to get out there and DO stuff. 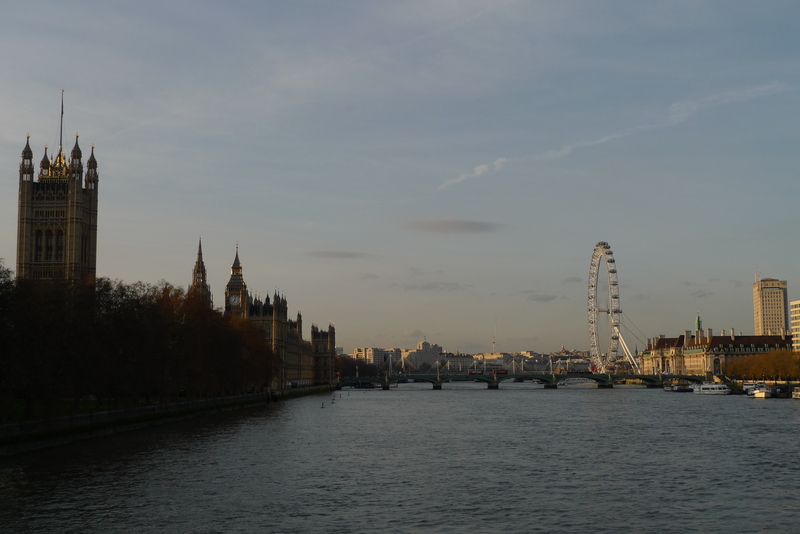 She is one of the most active Londoners I know – language courses, sports, exhibitions and gigs. The perfect HPL guest writer! 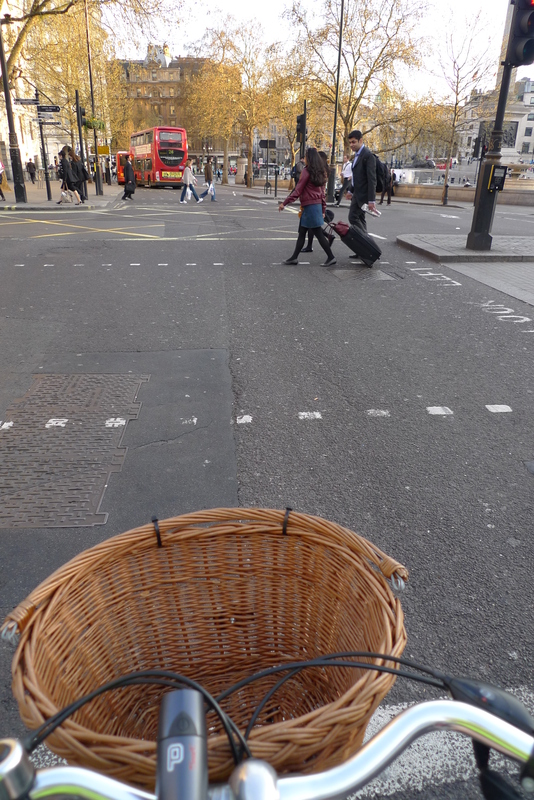 Anyway, like many Londonders, I have a bike (traditional ladies bike with wicker basket from Brixton Cycles – I absolutely love it) but am too much of a wuss to cycle to work. 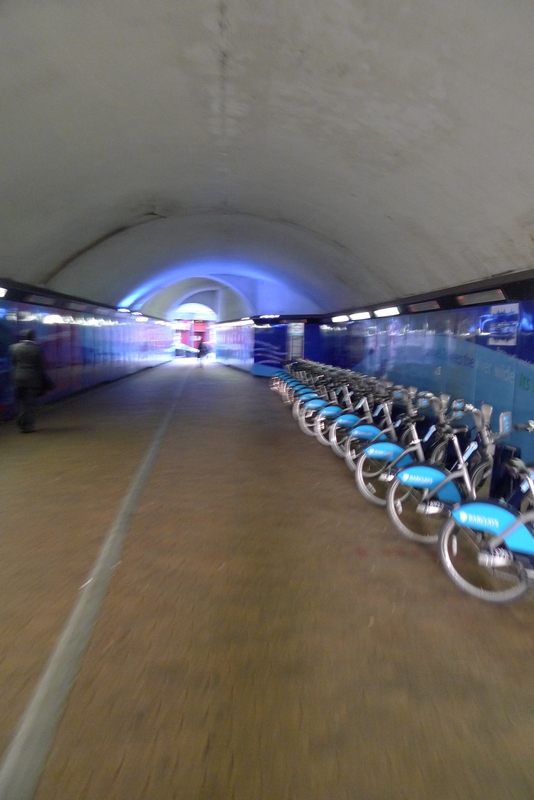 In this first HPL guest post, Pippa argues why more Londoners should get on their bikes. (If you’re a keen cyclist – also check out Nandos Bike Club). Having grown up in a city spread over the foothills of a mountain, cycling had never been something I found particularly enjoyable (give me a billycart anyday). 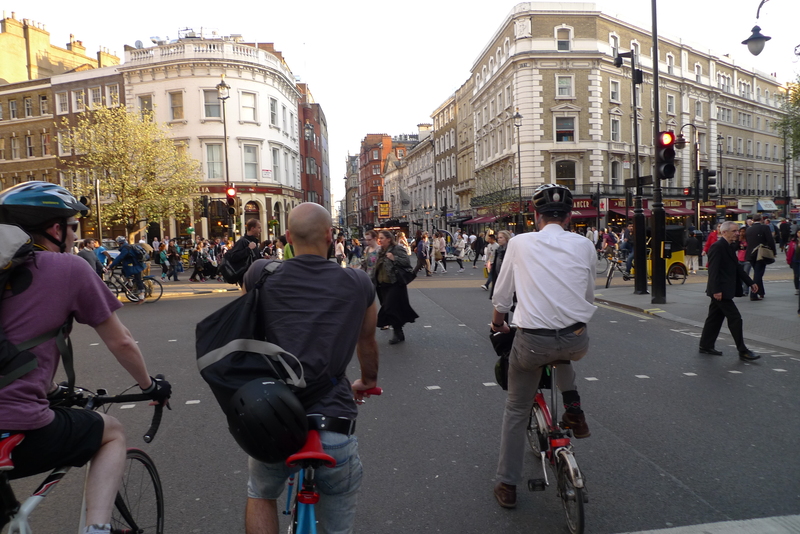 When I moved to London, on my daily bus commute I used to peer through the forest of armpits and out the window at the seemingly death-defying cyclists whizzing by and think ‘crazies’. So when my work introduced the cycle to work scheme, it was really only the thought of saving money that motivated me to get off the bus and get a bike. I was also motivated by the fact that riding would chop about 20 minutes off my commute. Yes, twenty extra minutes of snoozing = motivational. I made a deal with myself before I bought the bike. I thought getting on a bike every morning would be a bit of a struggle. And what would I do about showers and work clothes? And what about all those cars and –gulp- buses? The deal was, I had to make myself cycle three days a week, and I could reward myself with bus trips on the other two days. I really wasn’t sure I’d keep this deal with myself, and thought I might need to send someone round to rough me up and ‘remind’ me to get back on my bike. But oh my goodness I LOVE cycling! 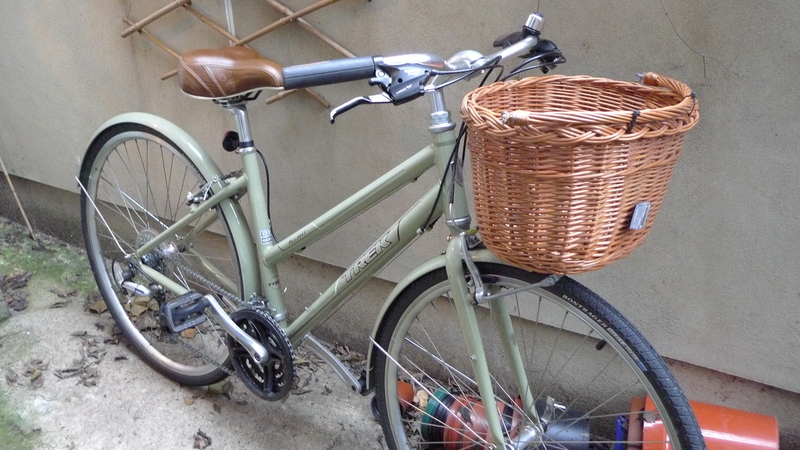 I love it so much that if I need to leave my beloved bi-wheeled beast behind (eg on those rare occasions I have a half-pint of low-alcohol beer on the way home) (Note from Sasha: I have never known Pip to drink anything low on alcohol in my life...!) I actually head back into work over the weekend to pick it up, just to ensure my Monday morning wake-up burst of energisation (is that a word? It makes sense to me). These days a bus trip to work is not something I would consider a ‘reward’. I love it so much I rode through winter (even some of the snow days). 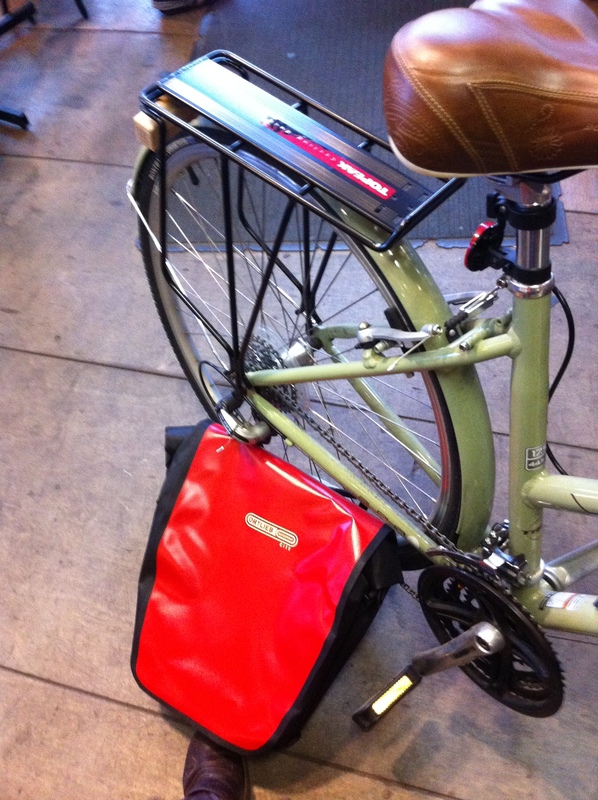 I love it so much I have become a ride-to-work evangelist. I love it so much I agreed to write a guest blog hoping to convert many more people to my cause. I now ride past people waiting at bus stops, smile to myself, and think ‘crazies’! Why do I love it so much? Well, now my bike is paid off, my commute is pretty much free (apart from the fun accessories and regular services I see as an investment), I feel wonderful getting a short burst of exercise at the beginning and end of a largely sedentary working day, I love discovering the nuances of back-street London, random shops, quirky bars, peaceful and suprising green spaces. I have also discovered London is (largely) flat, and if I keep to a leisurely pace for 9 months of the year I can cycle in my work clothes. 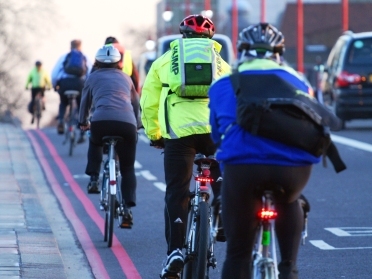 Many workplaces have bike racks or lockers and even showers if you work up a sweat, and there are so many people cycle-commuting these days, you can band together and ask for facilities many workplaces will supply or ‘discover’ showers and changing facilities on the premises. And if not, (can I say this here?) disabled toilets offer space, privacy, mirrors and the ability to at least have a bird bath if showers are not available on your work premises. I suppose the opposite of working up a sweat is cycling through the rain. I have heard the statistic, that if you cycle commute every work day for a year, both directions, on average you will only get rained on twelve times. This is an unsubstantiated statistic, but in my experience I do find it somewhat believable. 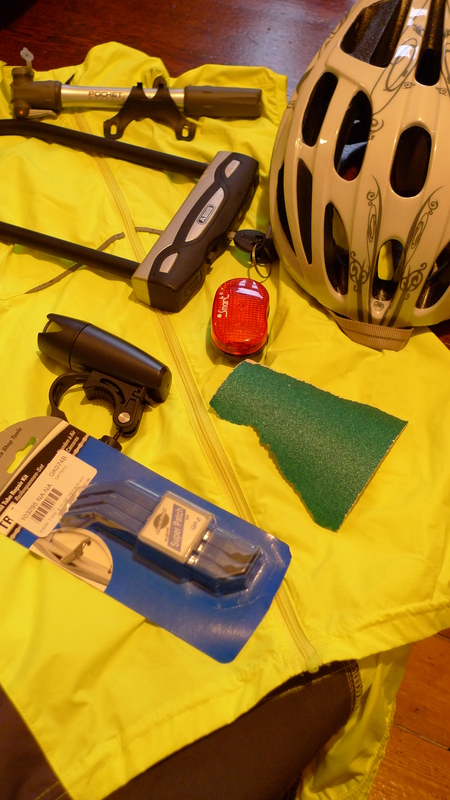 I figure my options are a) get wet (earn kudos), b) leave bike at home (done that once or twice), c) invest in waterproof trousers (I’m still considering this). And on the way home with a steaming bath and perhaps a glass of warming vino beckoning, it doesn’t really matter, does it? So what are the dodgy bits? 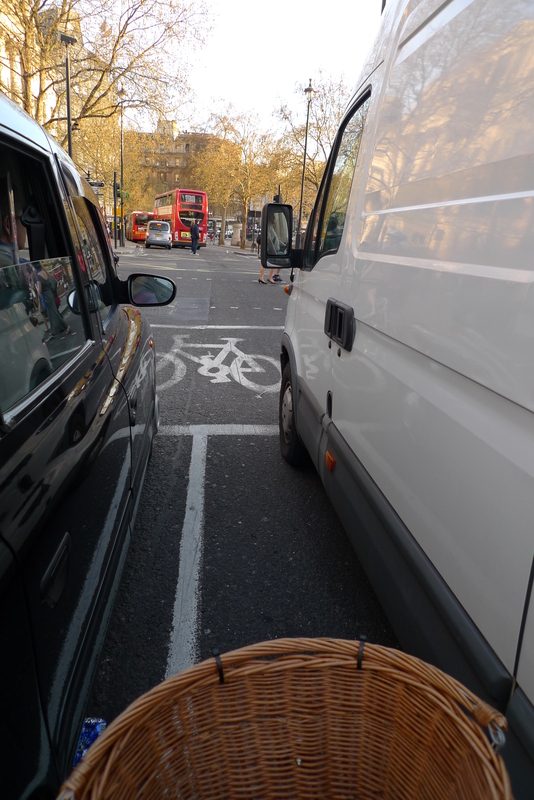 I find Black cab and white van drivers can sometimes be scary (I’m referring to the vehicle colours here), but it just takes a bit of time to find the right balance of caution/confidence on the roads. 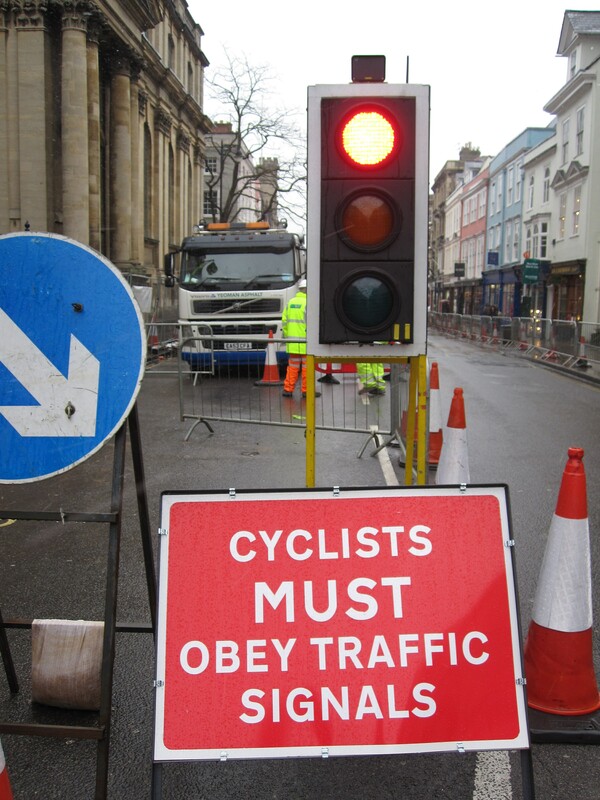 I also wish that those who cycle through red lights would stop, and think about what the implications for the rest of us who do obey the rules but sometimes get treated like we don’t. And pedestrians. Riding past hundreds of harried city pedestrians at peak hour is a bit like Frogger. These people are ‘obviously’ in a hurry, but pose a danger to themselves as well as to cyclists as they step off the pavement, or cross roads of stationary traffic only to pop out in front of a cyclist whizzing down the bike lane. 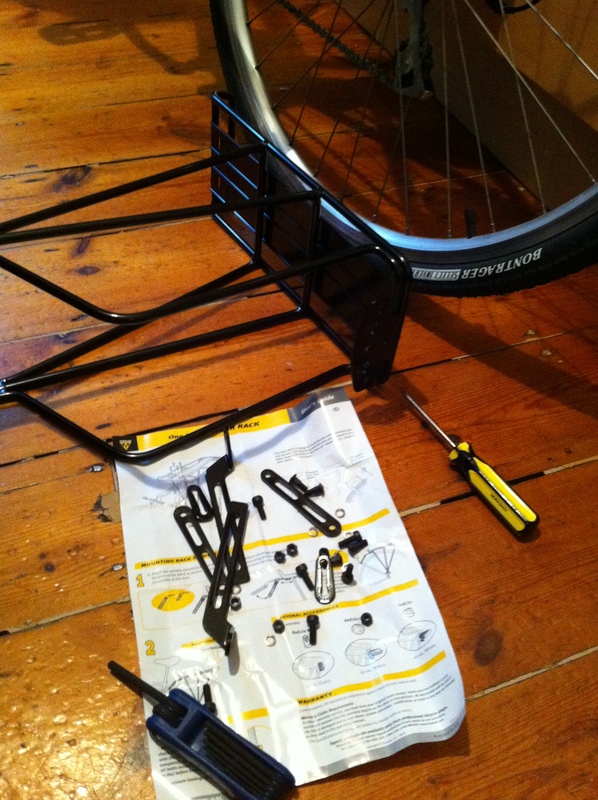 But overall cycling positives far outweigh the dodgy bits. So let me evangalise a bit more. Spring has just sprung, the leaves are budding, the snow has finally stopped, the clocks have just changed and there are months of bright long evenings stretching ahead of us. So why not invest in an alternative transportation and hopefully be as surprised as I was at just what cycling can do for your mood, your wallet, your wobbly thighs and your mental health? 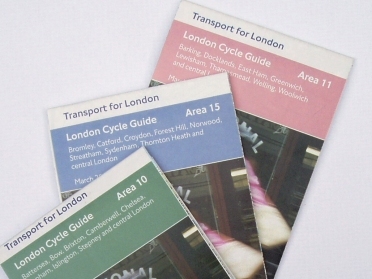 Many London borough councils offer free or subsidised 1:1 cycling lessons to help build up confidence cycling on roads. 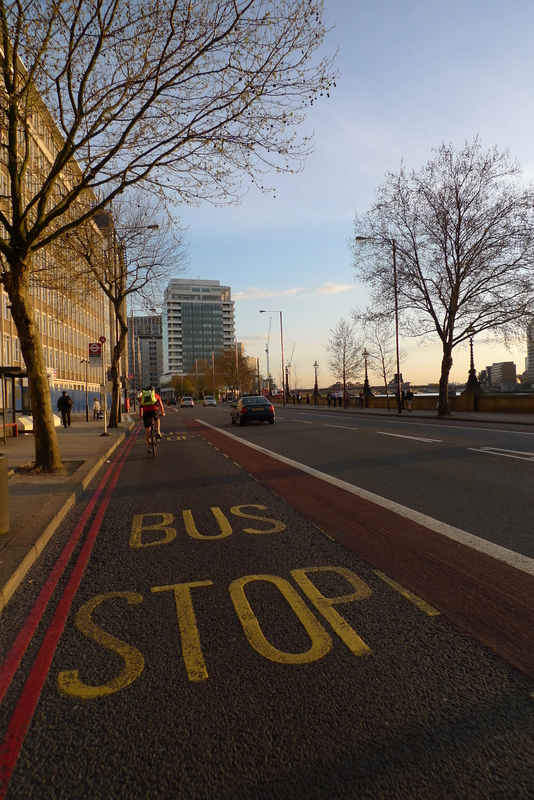 Some also offer guided ‘commutes’ during the summer months –contact your local borough council. A number of small firms offer onsite bike servicing. Why not get a group of cycling friends together for a sociable day of snacks, chats and bike services? Janis at havebike.co.uk also offers bike maintenance workshops to give you more confidence keeping your bike in good condition.